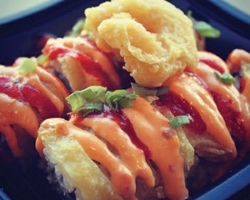 Yoshi’s Japanese Grill Hits the Road with Tavlo iPad POS and Epson’s OmniLink KDS Lighting the Way. 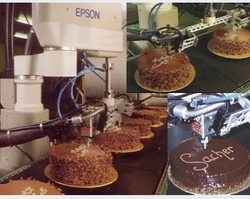 System Devices, the EPSON Robots agent for the UK, worked with Integrated Dispensing Systems to design and build a robotic cake decorating cell that solved the problem of icing messages. The cell used an EPSON SCARA robot equipped with an IDS stainless steel 2200-245-Series KISS™ Tip Seal Valve. Quest Flexible Automation showed an industrial pipe manufacturer a solution using EPSON Pro Six PS3-L (Long Reach 6 Axis) robots. 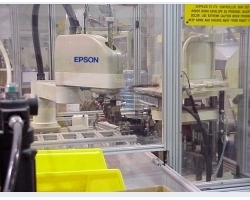 Several EPSON PS3-L Robots were installed over the injector machines. The robots take the water pipes from the molding machine and put them in the O-ring injector machine. 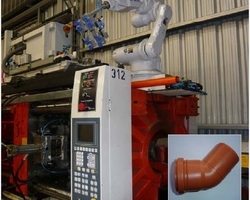 Flexible Automation designed and built a workcell that automated the handling and inspection routines. The workcell is equipped with an EPSON TT8800 robot and a simple pneumatic gripper. The robot picks up a connector from an incoming conveyor and loads it into a blanking press. After blanking, the part is transferred to a station that performs an electrical test. Next the part is moved to an automated vision inspection station that checks for flaws created during the injection molding process. 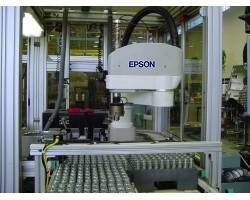 Two EPSON TT8550 SCARA Robots were selected for the complex motion tasks such as palletizing, screw driving and precision assembly; pneumatic devices were used for simple pick and place operations. Prior experience with EPSON robots had proven the reliability and robustness of the robots. Using an EPSON robot as the material handling device, Novi Systems Ltd., developed a workcell that automatically test inhalers and records the test results. 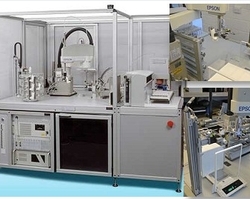 Called ICTUS - the Automated Andersen, the cell performs all the material handling, testing, result recording and equipment clean-up previously done manually.